“Show, don’t tell” is probably the most commonly given advice in writing, but there are places where telling is the right choice. Monday Writing Roundup. Links to five writing/publishing articles from the previous week that I have found helpful. Every writer has words or phrases that habitually show up in their work. Like a verbal tick, writers insert them without even thinking. They become fillers when we need a beat in dialogue, or a crutch when we’re not sure what the character should really be doing. They badger the reader by constantly drawing attention to themselves, forcing the reader to see the prose, rather than the story. Don’t let overused words ruin your novel. I recently finished a book by a well-known author, published with one of the big five, everything we all want to be, and I noticed something strange: the people in this book smiled. They smiled for deception. They smiled sarcastically. They smiled to calm their nerves. They smiled when they wanted to gloat over a victory. They smiled for just about every emotion, except happiness. And just like that mole on the end Grandpa’s nose, once I noticed it, I couldn’t stop. After noticing this peculiarity, ever time I heard the word “smiles,” it was like being smacked in the head. It yanked me right out of the story and doused in a mad dose of the giggles. So I started thinking about it. This person is a well-known author, light years ahead of me, was I just imagining this thing? I had to know. The Kindle app has the ability to count the specific instances of a word in an MS. I typed “smile” into the find bar. Result: 153. Spread out across a 400-page novel that meant someone smiles on average every two and a half pages, which for some words would not even be noticeable. But these instances weren’t spread evenly through the book. They clustered together appearing as many as four times on a page. Nearly every time two characters interacted, they smiled at each other at some point during the conversation. The smile had become a crutch: a habitual word choice inserted without thought. Word crutches appear in places where the inner ear senses something is off in the prose. Either a beat is needed between lines of dialogue, a paragraph is too short, or a non-POV character needs a moment to think about something.These crutches bog down a manuscript and make it feel repetitive, or in the case of this particular book, paint an absurd picture where despite pints of blood and gore, everyone is perpetually grinning. More often than not a good CP will find your crutches. However, they will likely not become apparent until well into the MS. So if you’re only passing out your MS in chunks, you’re missing an important opportunity. Scrivener also has a built in text analysis tool. Select a document. Project> text statistics. You can even organize the list by frequency. If you are working in Word, you can run your text through edit minion, or pro writing aid, which will also give you some other interesting nuggets, like passive sentences and cliché alerts. Once you’ve analyzed your text and found a few candidates, do a “find” in your word processor (I used Word. If anyone knows how to make Scrivener display the number of matches without replacing the word, please let me know) Be sure to click the “find whole word” otherwise it will include all the instances where your word appears as part of another word e.g. “port” in “support” Although you may have to run the search twice to account for plurals or verb tense. Let’s take a look at a few examples from my MS.
85 This is a maybe. This isn’t a romance, so this seems like an excessive use of a word that doesn’t come up much in daily conversation. I’m going to go back and make sure that it isn’t being used in the same way, or in some strange way that draws attention to itself. 272 This one is definitely a problem. I noticed it originally in my first draft. My supposedly adult MC was constantly rolling her eyes, which made her come off as a snot-nosed tweenager. But it looks like my characters are still spending too much time staring at each other. Another good one to search for is “look,” since this can indicate you have too much telling in your descriptions. Little words that are used frequently in daily conversation get a free pass e.g. articles the, a, an, common pronouns, and even the dialogue tag said disappear on the page. And to some extent other frequently used words. The opposite is also true. The more unusual the word, the more your reader’s ear will pick it out. The same goes for words that evoke a strong reaction. How may times do you think your MC can use vomit before it begins to sound stale? Can I just fix it with a thesaurus? No. Simply subbing one word for another will not fix an action that has become habitual in your manuscript. If I change half the “shifted his eyes” to “shifted his gaze,” it isn’t going to change the underlying problem that my characters are standing around staring at each other. 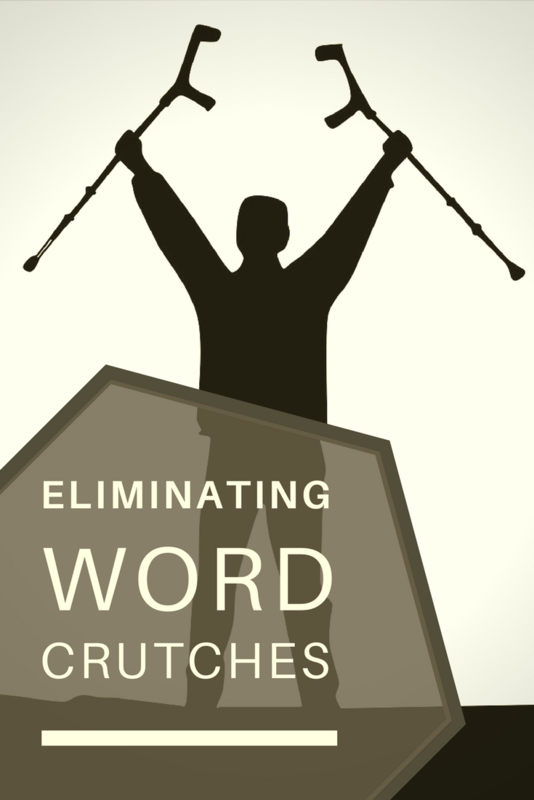 The crutch word is just the symptom. If I fix the real problem: my characters need to be doing more, the crutch word will disappear on its own. The next time you read through your MS look out for habitual phrases, actions, and overused words. Taking time to eliminate these from your prose will keep it feeling fresh through the entire story. In novels, “stage directions” are sections where the author begins listing a character’s visible actions without giving the thoughts or feelings associated with them. As a result, the reader is bombarded with useless information, unable to discern which actions are meaningful. The love interest is an integral part of contemporary plot structure. But too often that character is little more than a pretty face designed to be the main character’s dream girl. Today’s love interest needs to be more than just a skirt waiting to be rescued. Make sure your love interest is a person who matters. This is my first post on the blog hop The Insecure Writers Support Group: a monthly blog hop therapy group for writers. Co-hosts for the February 7 posting of the IWSG are Stephen Tremp, Pat Garcia, Angela Wooldridge, Victoria Marie Lees, and Madeline Mora-Summonte. When I was young, fantasy novels were a way to escape. The adolescent mind rebelling against some perceived injustice. The sense of wrongness in the world that I had no word for, just the driving need to escape. I read all kinds of fantasy because anywhere was better than here. In my teen years, the nameless repression began to identify itself as the message of my “true” role in life became apparent. I fled to fantasy. Whether it was Star Trek or Dungeons and Dragons, fantasy was a place where female characters weren’t penalized. I didn’t care if my heroines fought with swords, magic, or phasers. They could fight. Anywhere was better than here. As an adult, I began teaching in an urban school in a poor neighborhood. I watched my students do incredible things despite the struggles of poverty, and I thought, “If only they were living somewhere where they didn’t have these problems.” Surely, anywhere was better than here. Then I moved to a wealthy suburban district and watched the students there struggle not under the weight of poverty but of impossible expectations. I saw this at every school I taught. Every background, every race, every environment. No matter where I went, my students had the same needs, the same hopes. Only the monsters changed. This is what fantasy does. It illustrates what is common to all people. By telling stories in cultures that do not exist, it strips away the reader’s preconceptions and politics. By changing these rules, those biases no longer affect the reader’s experience. This leaves readers only the shared human experience. The basic needs that unite us: shelter, safety, belonging, and self-expression are present no matter how foreign the setting. Fantasy allows us to drop the expectation and biases of our own culture in favor of the common human experience. Fantasy isn’t about escaping. It’s about examining what is common to all human experience. The buildings may be different, but people are all the same. This is why I love fantasy and why fantasy is so important. Fantasy shows us that everywhere is here.